We live in an age of interruption, and push notifications have become a source of the same. Just install an app, and ping- you will start receiving all those irrelevant notifications. “Tag your friend on this completely irrelevant post, so that he opens the app just to know that this has nothing to do with him”. These are just the glance of what I usually receive, and how these notifications are not doing any good to me. However, it does not mean I do not want to receive push notifications at all. Affirmative! I do want to receive the pings, but just the ones I care for. That is why I cannot completely turn off push notifications at once. Because I equally receive and do not want to miss some crucial messages that I care about. It is the same with everyone with a smartphone these days. The people like me, who do not want to be bothered by irrelevant pings, are just stuck in the middle of ‘want to switch off the notifications but cannot do so either’. According to a research by Localytics, 49% of consumers believe that push notifications are of no use to them, and they prefer to turn them off. 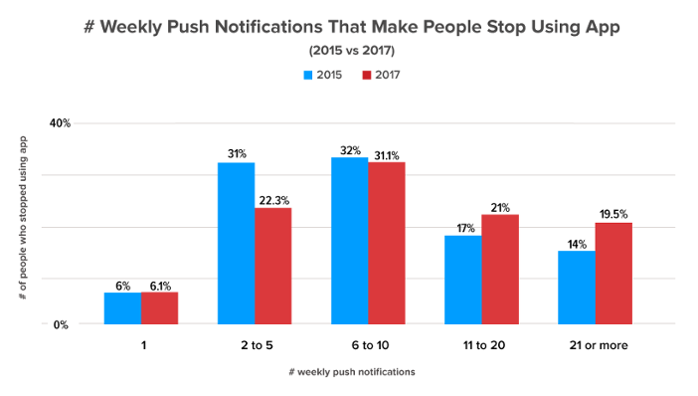 While there is another 50%, which believes that push notifications have improved these days, and they willingly opt-into the notifications. Marketers are getting better at pushing notifications, but there is still the 50%, which need some improvement. When asked if push notifications are helpful, only one in five respondents would say ‘yes’. The remaining respondents would not agree with it. For them, these pings are somewhat helpful or a complete distraction. The bottom line is, the perception of push notifications has improved, but they are still lacking in terms of value and relevance to the users. This is the fundamental line of all reasons why people block push notifications on their smartphones and web browsers. 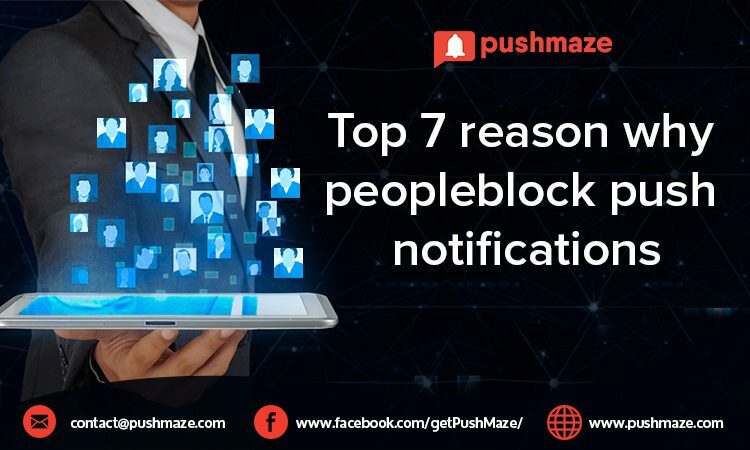 Why users block push notifications? A critical element for achieving effectiveness in push marketing is an effective ‘Notification Copy’. It consists of everything that you are going to put in the title and description of the notification. It ranges from the suitable character limit to clear and action-oriented text, i.e. everything that has to be squeezed into a small package while maintaining the proper delivery of marketing goals. An imprecise notification does not offer a direct value to the user and simply adds to the list of messages that are read once and forgotten at the subsequent second. Most of the times they barely receive a click through and are just swapped out to clear the notification board. Considering the following notification, you will comprehend how there is a thinner line between producing a vague copy and a copy that is valuable and interesting to the users. You can see the notification at the bottom is clear and appeals for an action. Whereas the top notification is merely informing the user of the sale. Push alerts are always time-sensitive. Even when not self-expiring, once delivered, they require a prompt response from the consumers. 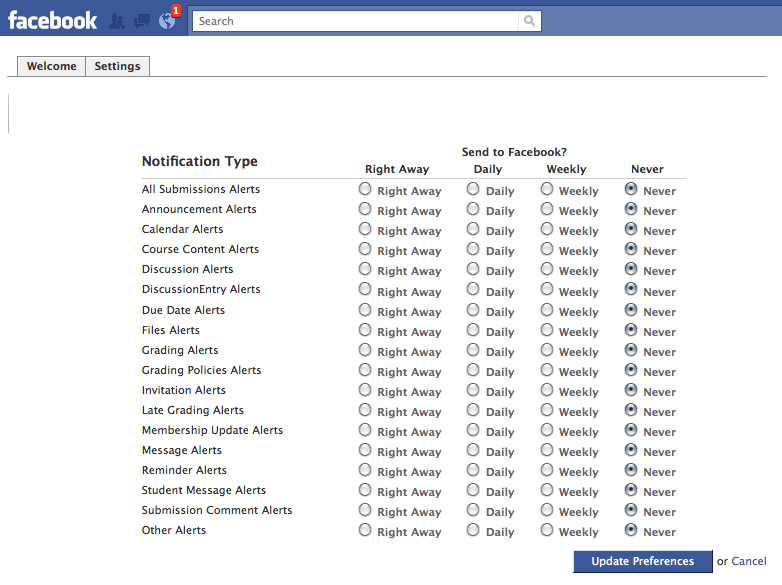 If they fail to seize the attention in real-time, they would either be swapped off or be cleared in the bulk with other notifications in the list. Timing is everything. A wrongly timed message does not just fail to acquire the attention but also annoys the user. Traditionally it happens after overlooking the time zones of the subscribers. As websites and apps send out notifications in a single batch, they are generally not particular about the time zones to deliver the messages at appropriate times. Users around the globe absorb the alerts at different times of the day. Pushing without considering the optimal delivery time results in a higher churn rate. Overlooking the accurate time when users are prone to open the app, would just annoy them and compel to opt out of the notifications. It is imperative to set the appropriate audience to receive your notifications. If you mistakenly target the wrong demographic of users, it will altogether fail the purpose. Hence, considering the specific customer personas remains an extremely critical concern for an effective push notification strategy. Working out without better serving the users and not having push messages personalized for them would make your pings irrelevant and irritating. Hence, it would encourage them to block push notifications from the annoyer. Marketers need to make better efforts in learning about the correct demographic of users by utilizing the push notifications services and tools that allow a more segmented approach of sending the pings. A research based on the detailed persona of subscribers will aid you to understand your customers and would make it easier to create personalized content that does not encourage them to stop push notifications. Example: Say you own online fashion retail. Segmenting the users based on the demographics like gender, age group, working class & students will ensure you never notify all the personas when announcing a sale of female apparels. Not knowing how much time is too much for your audience can kill your push campaigns and result in turning off push notifications. However, you cannot believe the same for every kind of notifications on the market. For example, a news app, which has been designed to update on every single newsflash would have a different threshold frequency as compared to an eCommerce mobile app. The type of audience can be deduced by properly segmenting into different demographics, time zone & in-app behaviors. While the type of notification is purely based on your products, services & type of industry. You can recollect the example of news app and an eCommerce app to understand better. Check out this graph from Localytics’ same research discussed earlier. In 2015, receiving two to five push messages would have caused 31% of users to stop using your app. While in 2018, the margin was reduce to 22.3%. People are becoming aware of the push notifications. However, they will still block push messages if they are irrelevantly frequent. According to Nielsen, an average American user today has 41 apps on his or her smartphone. Moreover, according to Localytics’ research, about 22% of these apps are use only once. Publishers need to work out some massively effective ways to cut above the noise and stand out in terms of usage and retention: personalization is one of those ways. Personalization can lift push notification click through by up to 800%. It is nothing new for the marketers. We all know that one-size-fits-all approach has gone vague and personalization is the new key to receive handsome ROI. Marketers, who believe in spamming all the users with the identical and irrelevant messages, usually head towards user engagement and induced opt-outs. The only way to send relevant and interesting pings is segmenting users and creating personalized copies for each of the segments. For example, in addition to the demographics, you can allow your users to set preferences on what type of notifications they want to receive. As the relevance of the content is important, communicating a genuine content is far more crucial. There is still a vast population of users who find push messages relevant and helpful. It is either because the messages alert them for something significant or because the content provides a genuine information. This concludes the notifications that contain authentic information establish effective user engagement. However, the internet is equally full of rouge practices like click-baiting. Most of the times, the click baits come from the sources that are not the genuine publishers. They are the paid marketers who charge from the brands on a pay-per-click basis. It is highly imperative to understand that push notifications are not merely mean to receive a click through. In fact, about 90% of notifications receive a certain click through without any click bait. The prime motive resides behind the conversion goals where the objective is to appeal an action from the consumer. With click baits, you will not only face an immediate bounce back but also a complete opt-out from your notifications. Tracking the in-app behavior of the users, publishers issue notifications based on different in-app activities. Behavioral targeting is an eminent tool for re-marketing. However, the research has also revealed a major section of consumers is not happy with the mere notifications triggered by a user’s in-app behavior. Almost 50 percent of respondents in the same survey conducted by Localytics responded that messages that come from behavioral targeting cause them to use an app very less. Most of the time they are irrelevant, annoying and irrationally frequent. While preference-based notifications caused them to use an app more and they are directly related to what they have signed up for. Fail to address the pain points. Undoubtedly, push notification is utterly new in the marketing field. The experts are still developing best practices and improving the push marketing strategies day after day. However, we still need sticking to some fundamental practices of marketing that apply to all the modes: Emails, Ads, SMS, and Push messages. For the time being, we must not fail to leverage the biggest improvement of push marketing tools: segmentation. With the help of ancillary techs like Google analytics, heat map tracking & A/B testing, we can still make our push campaigns a massive success. The market is saturate with tech that can gather user data to target the push campaigns. Employ these tools; help yourselves becoming more sophisticated, personalized and useful to your consumers. You will never receive an opt-out from a relevant user.